Hey everyone, i am back with a new paytm cash loot offer, the offer is from iReff app. 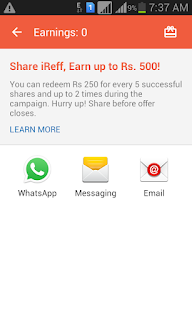 Invite your friends to iReff app and earn Rs 50 per invite, with this app you can earn a maximum of Rs 500 by referring 10 friends. so without wasting your time, lets come to the real offer. 4) Now start inviting your friend and earn free Rs 50 paytm cash per invite. You will earn paytm cash only for first time install, and you have to earn at least Rs 250 to redeem the cash.